If Les Metamorphoses is the future of folk, we’re in good hands. I’ve got the city right, but the venue’s all wrong. Montreal Airport is a strange place to be listening to a French-Canadian trad-folk album. Although located in Quebec, the heart of French-Canadian culture, the airport’s very existence is a strange vortex of dissonance. Named after a prime minister whose reputation is still controversial in Quebec (not least for declaring martial law in the province during a separatist terrorist crisis in the '70s), and built on grounds that hosted horse-racing a century ago, the airport is a far stretch from the quaint cobbled streets and imposing classical and gothic revival architecture of downtown Montreal. Here, the beers are mostly American, and the only decent food comes from a Japanese sushi venue. A search of duty-free yields nary a Quebec wine, and the only diversion to be had in the joint comes from a well-stocked iStore. A token effort is made by a café offering local micro-brews and faux-fur-clad armchairs by a faux-fire, but the paucity of beers on tap doesn’t beat the lineup required to get in. Yet insofar as the sterile globalized reality of Montreal’s international airport reflects the changing nature of what is without a doubt one of the most colorful Euro-settler cultures in the Americas, it’s a suitable backdrop to a band which also reflects the changing nature of that identity. Where Montreal Airport reflects the pale and stale of global culture, however, Melisande [electrotrad] represents very much the opposite: a testament to the truly creative results that can emerge from fearless innovation of traditional culture, expressed in this case through the musical stylings of a folk band that will appeal to a far broader audience than most. Folk as a genre is handling cosmopolitan globalization extremely well. The thirst of global culture for unusual and evocative "folksy" regions of the world that offer colourful and deeply human resistance to the bland aether of neoliberal pop has rendered quaint corners of the globe newly hip. From the Canadian East Coast to the Balkans; from the tortured, battle-scarred villages of Latin America and Southeast Asia to the Cajun, rural folk cultures are hot. But what’s truly exciting is that they haven’t simply acquiesced to their own fetishization; they’ve struck back with every bit of energy and innovation and shot a jolt to the system that affirms the hidden hopes of cynical urbanites the world over. 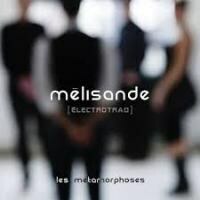 Melisande [electrotrad] is a case in point par excellence. Their new album showcases traditional Quebecois folk-tunes, but from a position that is innovative not only in terms of music but also in terms of artistic perspective. After all, what do you do when you’re a folk band covering songs from a deeply patriarchal, even misogynistic colonial era, one where maidens are married off without their consent, or wind up spinsters in spite of deep-seated passions? Well, you start by rewriting those folk tunes, which is precisely what Melisande [electrotrad] has done. Fronted by the talented chanteuse of the same name, their new album Les Metamorphoses features modern-day remakes of traditional French-Canadian folk tunes. But the powerful singer who heads up this talented foursome isn’t bound by the past; she reinterprets and even rewrites some of the songs to give women the power and agency which a reconsideration of traditional history might reveal them as possessing. This isn’t just a quirky approach to song-writing: it’s the very raison d’etre of Melisande’s latest strike at the folk genre. The band’s bio makes no bones about their challenge to tradition: “Melisande decided to examine the plight of women in traditional Quebecois music... Bringing in electronic beats, a feminist perspective, and the cutting-edge music of modern Montreal… Melisande stepped into Quebecois traditional music with the express purpose of modernizing French-Canadian women’s role in trad-folk”. A perfect example of this remarkable style is the traditional tune “Sort De Vieille Fille” (“Role of an Old Maid”), a folk song in which an aging woman laments over her lack of a husband. Melisande embellishes the song with a boppy, almost J-Pop ‘80s style synth-line, and then reworks the lyrics into a celebration of women’s agency, in which an intelligent thinking woman realizes the virtues of not being encumbered with a husband. This is Franco-Canadian folk done Melisande style, in which minor variations recontextualize the women of historical Quebec as active, powerful characters wielding the agency folk stereotypes have often denied them. And why not? These are, after all, folk-tunes for the modern era, reworked not only with feminist lyrics but also with modern beats and electronic accoutrement. The album’s opening song sets the stage, and typifies the style: “Je Fais La Difficile” kicks in with rising electronic beats paired perfectly with piercing and fast-paced violin, haunting flute and the powerful, upbeat vocals of the group’s female lead singer. The upbeat style is echoed on other impressive offerings such as “Le Vin Est Bon” and “Dans Paris Y’a T’Une Brune”. Some songs -- “Mourir a 17 Ans” and “La Recompense”, for example -- are slower, but maintain the fusion of modern instrumentation coupled with echoes of their trad-folk origins. Other tracks -- “La Blanche Biche”, “Les Metamorphoses” -- combine a retro synth-line with emotive Francophone songwriting. The album also features the talents of Alexandre de Grosbois-Garand (of the popular folk band Genticorum) on flute and bass; Mark Busic on keyboards and programming, and Robin Boulianne on violin/mandolin/banjo. The foursome offer a delight with Les Metamorphoses. Melisande is without doubt the star here: her confident and adaptable vocals coupled with her creative curation of Quebec folk-tunes (involving the occasional re-write to make them palatable for a modern, feminist era) ground this album as a creative, inspiring and delightful milestone in Francophone -- and global -- folk music. It’s an album with broad appeal: creative and intelligent content coupled with music that blends the best of old and new worlds. It’s a positively inspiring, toe-stomping exploration of Quebecois folk that’ll sound just as natural on the college dancefloor as the folk festival circuit. Melisande is the voice of today’s Quebec: a creative fusion of tradition and innovation that honors the past while re-interpreting it for the present. If this is the future of folk, we’re in good hands.